A friend at work just pinged me the Myers Briggs test as a bit of laugh at lunch-time. I had never actually heard of it, but it is basically a personality test (first published in 1962) to identify your key character traits and strengths. I highly recommend trying it out as it only takes 5-10 minutes. There are sequence of 70 or so statements that you answer Yes or No to - that's it. Some of the statements are quite amusing, such as e.g. 'I would rather read a book than go to a party.' Ah yes, that is a quandary I often find myself in. 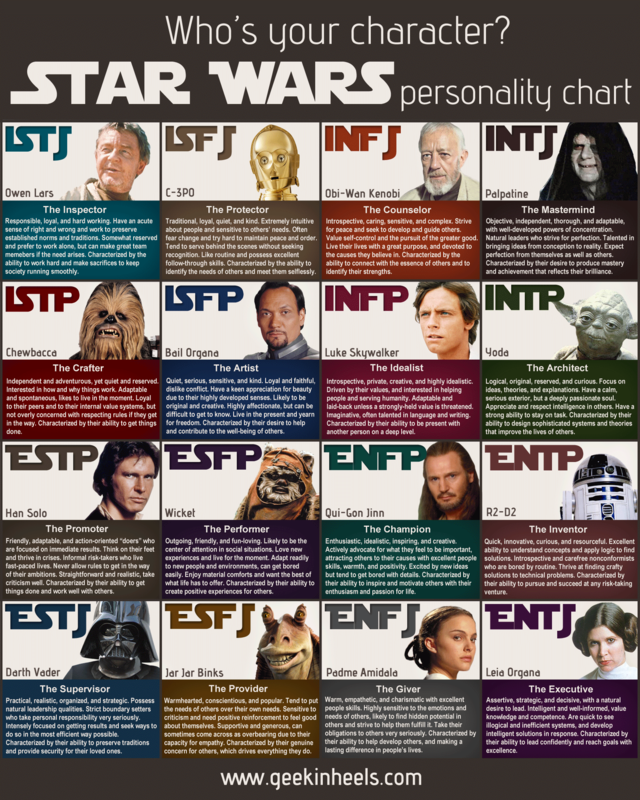 There are basically 16 different personality types and some ingenious person has mapped them onto the Star Wars characters, and this is why I am Obi-Wan Kenobi. What a relief, if I had turned out to be Jar Jar Binks, I am not sure what I would have done.